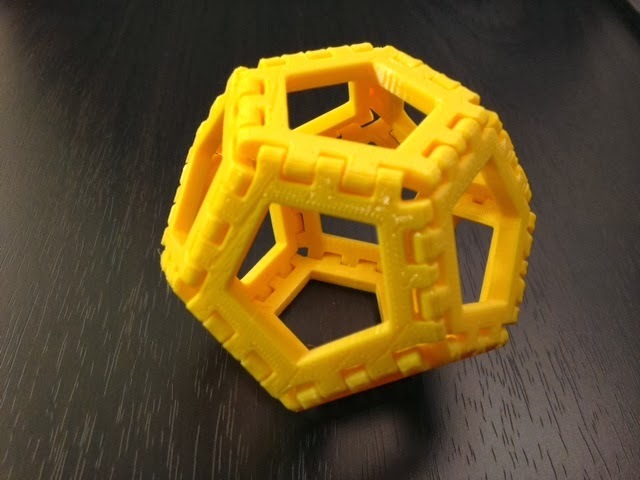 Of all the hinged polyhedral nets we made for the Makerbot Academy Math Manipulative Challenge, the dodecahedron came out the best. It just hit the sweet spot of angle and snap closer tightness. You can even see a video of 8-year-old C assembling it in under 30 seconds. Settings: MakerWare .3mm/low on a Replicator 2 in an hour and 45 minutes, printed in one piece with hinges fully assembled.